Captain Picard finds himself leaping backwards and forwards through time as part of Q's ongoing trial against humanity. 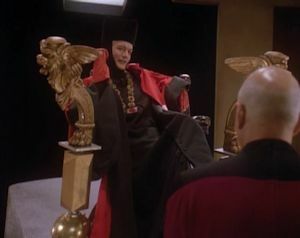 In the end, after Picard has finally collapsed the anomaly and saved mankind, Q says, "The trial never ends, Captain." He comes very close to breaking the fourth wall as he starts explaining what it is humanity has to keep doing to prove itself into the future, to better itself and push the boundaries of existence. That is what Star Trek is all about. This episode, then, is an attempt to wrap the entire series into a nice little bow and send it off as a complete package. It accomplishes this task through a variety of clever ideas and narrative symmetry, but mostly through reminding us of where the show began. Much of this episode takes place in the same time period as the pilot episode, "Encounter at Farpoint," and indeed, it is a direct sequel to that story, the continuation of Q's trial of humanity. Star Trek, despite a few cloudy episodes now and then, has always strived for moral clarity and noble vision, and the trial of humanity is a great allegory for how we face the greater moral dilemmas of society and progress. In this light, Q, though mischievious and unpredictable, represents our collective conscience, and when he says that the trial never ends, he is reminding us that we must always be vigilant to keep or morals in place lest we risk the destruction of everything we hope to become. Throughout TNG's run, it has walked a balancing act between episodic television, where each episode is independent of every other, and serialized television, where each episode is just a chapter in an ongoing saga. It never fully embraces either dynamic, but this final episode is able to find the common threads of the show's DNA and package them in a way that they appear to be one long story. We see where our characters started and where they could end up if the story were to stretch onward from here, and that shows us that the show has always been evolving, even if many individual episodes can stand apart from the whole. For this reason, "All Good Things..." is a masterful final flourish and one of the finest examples of how to properly end a television show. Having said all of that, let me bring it back down to Earth and get nitty gritty with my notes. Future Trek writer Damon Lindelof has cited this episode as part of his inspiration while writing Lost. It's hard not to see the parallels: Picard jumping through time is like Desmond looking for his constant; Geordi's eyes healing and Ogawa's pregnancy failing are reminiscent of Locke being able to walk again and pregnancy always going wrong on the island; etc. This episode has a nice cameo from Tomalak (who mysteriously never arrives in the Devron system), but I think it's a lost opportunity to bring back Sela. With Denise Crosby already in the cast as Yar, there could have been some way to finally deal with the existence of Sela in a meaningful way. Then again, it would probably have muddied the waters a bit too much, distracting from the rest of the narrative. Why are there no drug-addled, gun-wielding bailiffs at the trial? They do a good job with the past: the old uniforms and haircuts, Data's talkative rambling and curiosity, Worf being confused for head of security, O'Brien being there, etc. There's even a few nice touches like Picard's "Earl Grey hot" not being programmed into the replicator yet. There's also a subtle reference to Admiral Satie from "The Drumhead." They also do a good job with the future. The make-up work on Crusher and La Forge is particularly good, and I love the redress of the Enterprise. I also like that they evolve the Trek universe with things like a Federation cloak, the Klingons taking over the Romulan Empire, the new logos and uniforms, etc. I am a little baffled by the Warp 13 stuff, though. In theory, Warp 10 is supposed to be a hard limit, as it essentially represents infinite speed, but perhaps, in the future, the warp scale has undergone significant refinement. After all, Warp 13 is easier than saying Warp 9.993. Each character is given a turn to show how they've developed in the future. Picard is a retired ambassador tending to the Picard vineyard; Geordi is a novelist who married someone named Leah (most likely Leah Brahms) and received new eyes; Data is a professor at Cambridge with dozens of cats and the newfound ability to use contractions; Riker is an admiral who is able to command the Enterprise as his personal vessel; Crusher has become the captain of her very own medical ship; and Worf has become a full-fledged Klingon, a former member of the High Council, and a governor of a Klingon colony called H'atoria. There's also a lot of care put into the two main romantic entanglements: Picard and Crusher got married and then divorced (is this the first reference to divorce in Star Trek? ); and the love triangle between Worf, Riker, and Troi is made more meaningful by Troi being dead. Why doesn't Picard trust the Data of the earliest time period with what's going on? He knows he can trust the android to keep a secret. Why doesn't Picard in the future make someone conduct the same neurological scans on him that Crusher conducts in the present, to prove that he's not senile? It would save a lot of trouble for him later on. "I don't think we should start second-guessing ourselves." I am seriously sick of that noise; it has never been the wiser course of action. How can Q say they're in France over three and a half billion years ago, when three and a half billion years ago, the Earth's crust was completely different? The ground that would become France was probably mantle distributed throughout the Earth at that point. Why the crew in the past doesn't mutiny against the captain is beyond me. Sure, you should have some faith in the captain, but such blind faith? At this point, with the knowledge that everybody is probably going to die, why doesn't Picard just come clean a little about what's happening? So, after it's over, does Picard ask Crusher to check his brain for that structural defect that can cause Irumodic Syndrome? Since there is a discontinuity between the three time periods, why does firing the inverse tachyon pulse in each cause the anomaly, since one would have no effect on the other two? The third pulse is fired by the Pasteur, not the Enterprise. When the Pasteur arrives in the Devron system, the anomaly should be there, shrinking into nothingness at the exact point that the pulse is fired. It may possibly expand from there into the future, but it should definitely be expanding from that moment into the past. Why doesn't the universe cease to exist at the exact moment that the Pasteur fires the tachyon pulse? If the anomaly stretches back in time and prevents life from ever forming, why are there still people around to see the anomaly once it's been created? The "anti-time" weirdness, where Geordi's eyes start regenerating and old scars start healing, is similar to the effects of the Ba'ku planet in Star Trek: Insurrection. Best episodes: "Parallels," "Lower Decks," "All Good Things..."
Jeri Taylor took over most of the showrunning duties in Season 7, which is partly to blame for many of the problems that permeate the final run of episodes. One of the things she did is close the open submission policy that TNG had been using to gather scripts up to this point, forcing the writers to work with what they had instead of looking outside the box for new ideas. As a result, Season 7 feels like watching TNG run out of steam. There are certainly some great episodes to be had--and the production values are the best there is--but a lot of the story ideas are unoriginal or badly executed, and nearly all of the character arcs are completely abandoned in favor of questionable extended family episodes, strange digressions that lack a coherent tone, and a lot of uninteresting melodrama. This final season is still good, on the whole, but it is also a jump backwards in the show's evolution. It's probably a good thing there isn't a Season 8, because many of the strongest episodes occur near the end, when everything is obviously being wrapped up.